Last week was an incredibly rough one. Our sweet little kitty died. She was with us for exactly one year, one month and one day. And it wasn't anywhere close to being long enough. 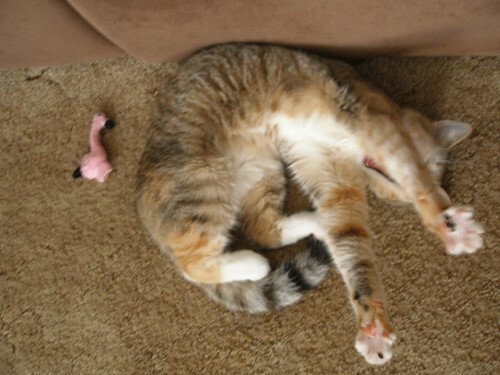 Her cup tipping aside, she was just the best kitty ever. -When she was younger she would stand up on her hind legs just like a little Rory Calhoun (or for those of you who don't get the Simpsons reference, like a meerkat). -She was the most un-scratchyist and un-bitiest cat I've ever known, at least when it came to people. 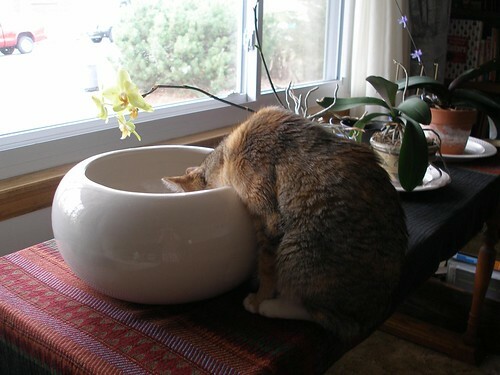 -She preferred drinking out of our wishing well to the watering bowl with pump we'd bought her for Christmas. -Whenever Joey cried, Isadora would come to see what was wrong. -A friend once said about her, "If all cats were like this, I'd actually like cats." -When she wanted to get down from the window above our bed, she'd meow politely at Jeff and he'd roll over to give her room to land. -Sometimes in the middle of the night, I would wake to the sound of her playing with Joey's trashcan. -She was a goof, so she fit in well around here. Here are a few more videos of her silliness. -She loved to sit on my lap whenever I was on the computer. 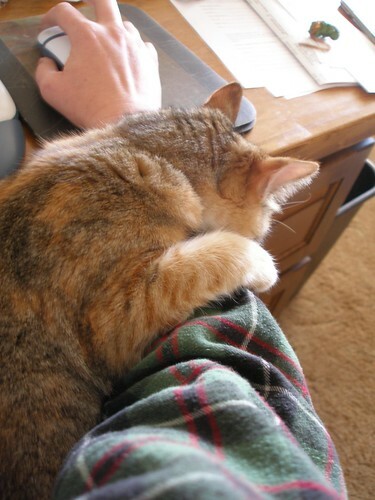 She'd then lay her paws and chin across my arm, despite (or probably because of) that particular pet peeve of mine. And I totally let her. I actually looked forward to it. And I am missing it desperately today and every day I've sat down at the computer since she's been gone. Goodbye, Sweetheart. We miss you so very much. I am so, so sorry. What a sweet kitty who lived far to short of a life. I knew you were posting this, and it still hit me like a ton of bricks when it came up on my reader. I'm so sorry. I had my cat Fatty for 21 yrs. Oh the pain of losing him. Now we look back and laugh at all the goofy things he did. We miss him but now I can talk about him without crying buckets. So sorry. 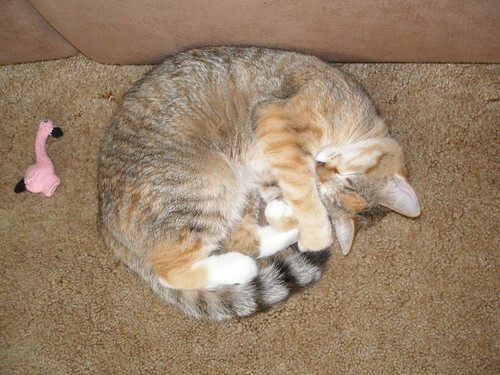 What a sweet cat, and so sad that she had so short a life. You guys made it a very special year for her-far better than the one she would have had without you. Once again, I'm so sorry for the pain you're going thru - like Jeff, I knew this was probably coming, but to see actual movies of her just took my breath away, even though I only actually met her once! You are soooo lucky that you have videos of her! I'm sorry for your loss. How very sad. I'm so sorry for you loss. Its so sad when a beloved pet dies. I feel for you. Thank you all for your nice thoughts. Most of the time I'm fine, but then I'll start looking around the house for her and immediately realize that she's gone. And then I sit down and have a good cry. Linda (Wander to the Wayside), the first couple of days were really rough, but since then Joey's been handling it pretty well. It still comes in waves for all of us and the rest of us are just as upset as she is. Which I think is good for her, to know that she's not alone in her grief and that even her stoic daddy is crying about this. We've also spent a lot of time talking about death and the meaning of life so that's been good. 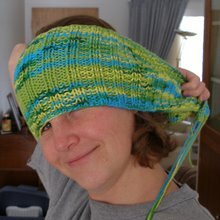 Craftydabbler, I have to say that I love the picture of yours that's next to your comment. They go together perfectly and totally make me smile. I'm so sorry to hear about your loss. A pet is truly a part of the family in every way. Oh, I am so sorry. She was just too good for this world, I guess. Oh, sadness. Losing pets is so hard. Especially nice ones that don't bite and do hilarious things like swat at the trash can lid. You were lucky to have her for as long as you did. Awwww, I just read about your sweet kitty. I am so sorry for your loss.